This is a perfect “I’ve gotten home late and can’t be arsed to cook” recipe. Apart from a bit of chopping, stirring and kettle boiling, it’s super easy and only takes half an hour. Plus it makes loads, so you can keep some for later in the week and/or lunches. 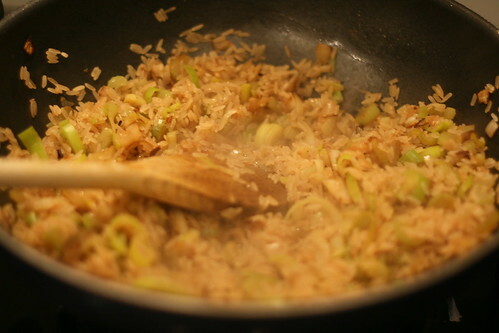 Spray a wok or deep frying pan in Fry-Lite and cook the onion, celery and leek in it for about 15 minutes to soften them. Then stir in the risotto rice. 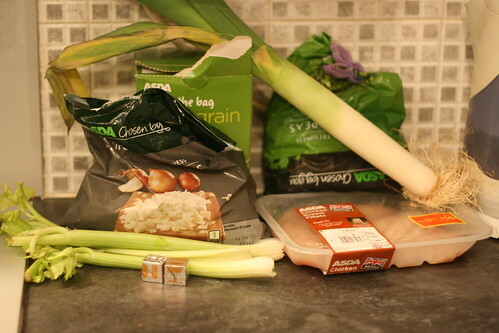 Heat the chicken stock (or just make it with a stock cube and boiling water) and gradually add it to the rice, stirring well and letting the rice absorb the liquid between each addition. 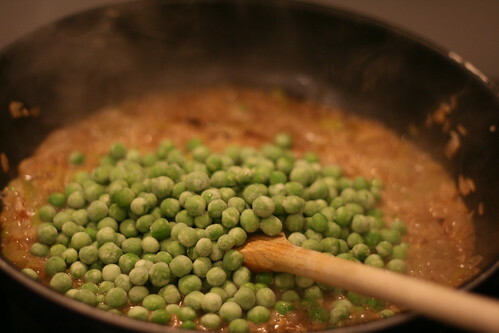 After 10 minutes of this, add the frozen peas and continue to cook for 18-20 minutes — or until the rice is cooked. About 10 minutes into this stir in the chicken so it heats through. And genuinely, that is it. Such an easy recipe. 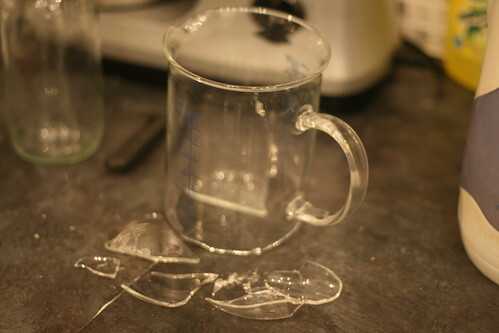 The biggest problem I had with it was that I dropped the jug and broke it. Sorry for a boring post, but it’s really just a simple and delicious recipe. So, so lovely. Nice and moist and tasty and healthy. Lush. A few more photos over here, but really you don’t need them. Simple, nommy recipe. Yay! Hi I notice in the picture have chicken breasts and in the recipe you say cooked chicken. Did you cook the chicken first please. Yup. 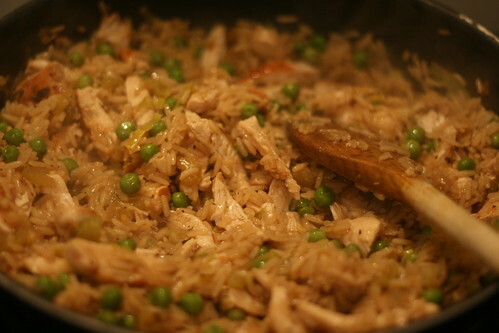 In this recipe I boiled the chicken breasts and shredded them, but really you can cook the chicken in any way you like so long as it’s added to the risotto in bite sized pieces.